Yeah, me too. -sigh* I just want a guy to love me not even these extremes. Hey EDC! What's going on? I see that alot of you new guys are wondering which Shannon(Shanon) is in charge and it's the one with the 2 n's (skylarblue, sky or shannon, or even shan, if you wish), lol. I control the Ruler of Doom! As of right now, there isn't anyone who has committed a major infraction that warrents the Ruler, so relax but I know that since alot of our members haven't been on, the conversation level has come to a minimum. Even though I'm not a MOD, along with Carrie and Heather, we are the nearest things to one here in the EDC. So on to the question that was posted. Jeez I could go on forever about that but I will limit my comments. LOL! Personally, in my opinion, I don't feel that Rose would have ever given Emmett a chance. If you look at it they basically grew up on different side of the tracks. Emmett being a son of a farmer basically and Rose being a child of a family who was "rich" during that time. Rose would have never given Emmett the time of day because I believe that she thought he would be beneath her. If any of you have read Emmett's omitted story, you would see that Rose only saved Emmett because he reminded her of her friends child. I think we have to remember that Rose grew up in a family of privaledge, while Emmett was a son of a farmer, so they would really never have interacted. If any of you guys need an OC to talk too, I'm here. Even though I don't post alot, I do come on an linger to see what's going on. So feel free to send me a PM if you have any questions or concerns but even though we may not be around, remember we are lurking, so I would hate to have to pull out the ruler on anyone. Just remember to keep it on topic and relevent to Emmett. 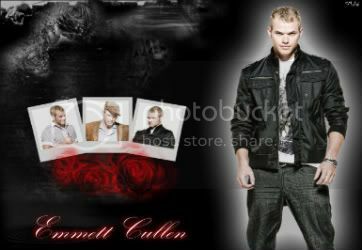 Also, I think enough time has passed that if you want to discuss Emmett's role in Eclipse feel free. It seems that most of you have seen it so far and it's okay to discuss. Toodles, Luv You Guys & Have Fun! Shanoon~ I tottally agree about Rose. She would never have given Emmett even a chance. Na'ama~ I got hit by the ruler of doom, once... Derek stole it from EDC and whacked Ali and I on JCA. We were talking about Ali's twisted ankle or something. What is your favourite book for Emmett-ness? Moira~ What is JCA? Jasper? And what IS the ruler of doom? Who is the ruler of doom Quilnish thread? Back on Again! lolz I keep disappearing after I get on again but life is so hectic and then its like 2 weeks later and im like Oh god I haven't been on EDC or the Lex for weeks! stupid school is starting we get laptops this year though so yay! Honestly I don't really have one cause I don't think of Emmett liking to read he just doesn't seem the type at all. So I don't really relate him with books outside of Twilight. you get LAPTOPS from SCHOOL?!?!?! Luckyyyyyyyyyyyyyyyyyyyyyyyyyyyy! *sigh* Let me explain the question. What is your favorite book for Emmettness? means what is your favourite Twilight book for most epic Emmett moments? Raven~ Are you a tween? I seem to remember you being a tween... or I could juts be tired. LAPTOPS? lucky. only two people in my old class get them, 'cause they have a small learning disability.